Ok I know this sounds insanely disgusting and should be confined to gastronomic purgatory. “How bad could it be?” was my exact thought before eating this… “Not too shabby” was my next thought. Yet, somehow the flavours go really well together. I first saw this pairing done by Heston Blumenthal (on a show called Kitchen Chemistry) and thought he must have a brain tumour that’s effecting his taste or something, until he went to have the aromas analysed in a lab. 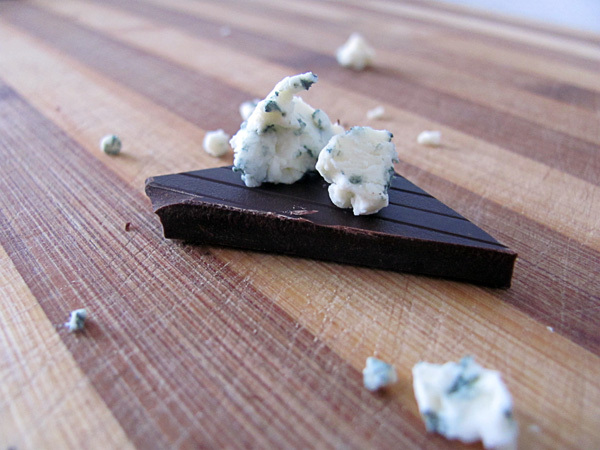 There was a whopping 60% overlap in aromas between chocolate and blue cheese! 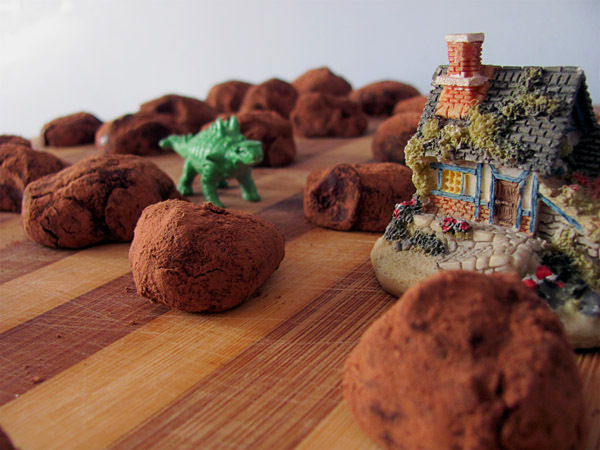 Blue cheese and chocolate are like having dinosaurs in Downton Abbey… I’d watch that! 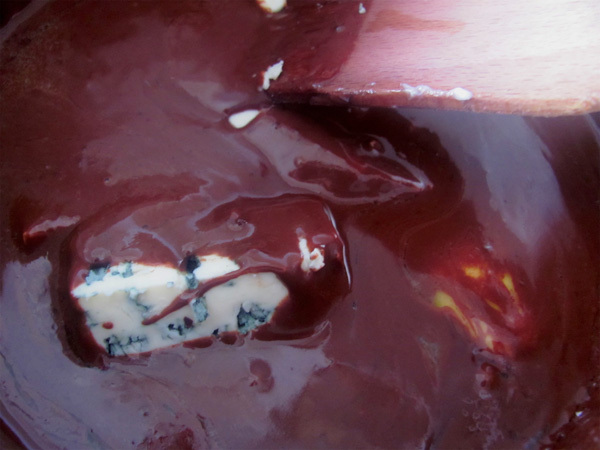 In a double boiler warm up cream and add the chocolate, stir until it’s all melted nicely together. Add the butter – this gives a it a nice glossy look. Add sugar to taste. Then came the moment of hesitation – I had no idea how much blue cheese to put in… then I remembered the cheese on my chocolate cracker was slightly less than 1:1 and the chocolate bar was 100g so I went for 80g blue cheese. I really think this ratio is a cracking good one. Stir till everything has melted, then pour into a container and put it in the fridge freezer to firm up. Don’t put a lid on it or the steam will condense and run into your ganache, unless you want liquid in there. 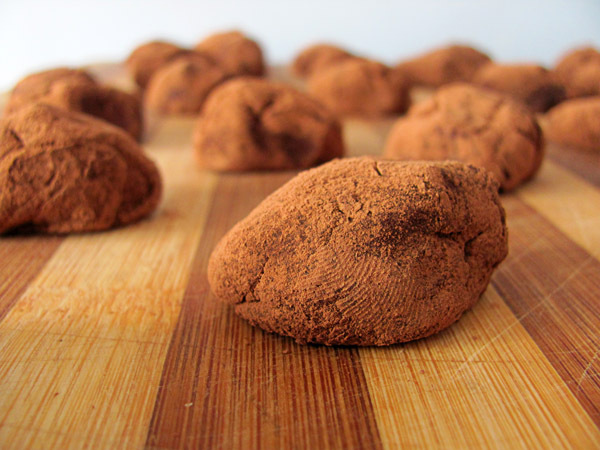 After I superbly spooned out the thick ganache and sprinkled them with cocoa, I deftly rolled them into balls. Place them back in the freezer to firm up some more in their new shape and presto! 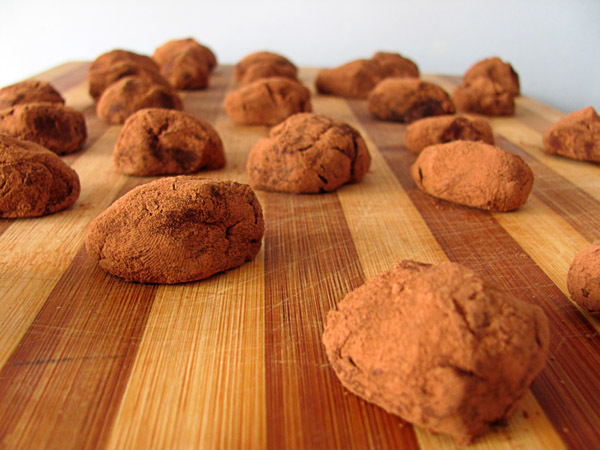 Blue cheese and chocolate truffles. I gave one of these gems to someone that hates blue cheese without telling her what was in it… she loved it! I hope you try this out and let me know what you think – as always comments are welcome. What a wonderful recipe. I shall try it as soon as I have bought the ingredients and pass on my opinion.